If your Homelite small engine trimmer needs a replacement gas tank, trust Jacks to get you what you need. 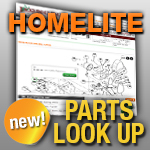 If you know your Homelite part number, match it below. We'll get your Homelite small engine gas tank to you fast.